Whilst we feel that our standard delivery (engraving, assembling and delivering our orders in 5 working days) represents great service at a fair price, we recognise that this sometimes just isn’t fast enough to meet the tightest of deadlines. This is where our express service comes in. Allowing you to place your order through our site and receive your awards 3 working days later (or 4 days in more remote regions). Just add your items to your basket as usual and then select ‘Express Delivery’ at checkout. Whilst we feel that our standard delivery (engraving, assembling and delivering our orders in 6 working days) represents great service at a fair price, we recognise that this sometimes just isn’t fast enough to meet the tightest of deadlines. This is where our express service comes in. Allowing you to place your order through our site and receive your awards 4 working days. If our 4 day express service still isn’t quite fast enough, please get in touch with us. Whilst we cannot promise to help out in all cases, we will do our absolute best to get your trophies to you in time for your event. It’s amazing what we can achieve when circumstances demand! 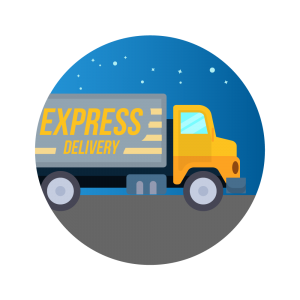 To read more about all of our available delivery options, please click here. If our 3 day express service still isn’t quite fast enough, please get in touch with us. Whilst we cannot promise to help out in all cases, we will do our absolute best to get your trophies to you in time for your event. It’s amazing what we can achieve when circumstances demand!